French toast continues to be a world-wide phenomenon and we are taking it gluten, dairy, nut, and even soy free with our latest recipe. 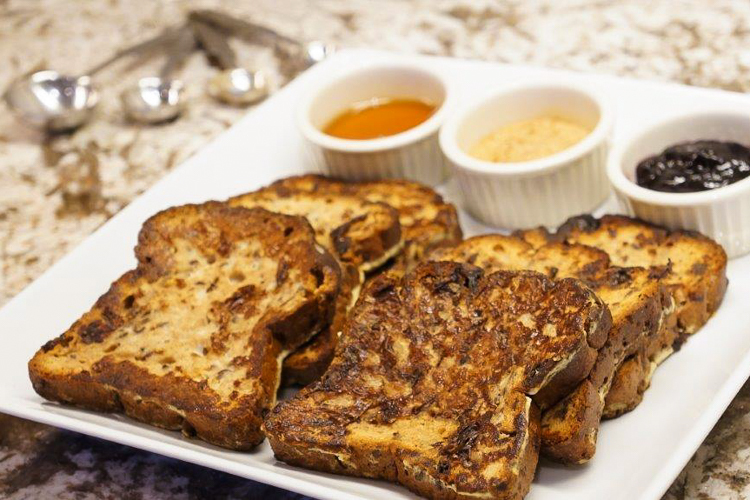 Using our new Cinnamon Raisin Gluten Free Bread we are creating a delicious french toast. Try mixing up a topping of Cinnamon-Nutmeg Sugar* for additional spice. Wisk eggs, salt, maple syrup and milk together and pour into a shallow pan. Soak each bread slice in egg mixture 30 seconds per side. Over medium heat, coat pan with a thin layer of butter and cook each piece until golden-brown on each side. Top with additional Maple Syrup, Cinnamon-Nutmeg Sugar*, or your favorite jam or jelly and enjoy! Try doubling this recipe to use your whole loaf. Store any leftover slices back in the pouch, putting the pouch in the plastic bag that came with your bread. Refrigerate or freeze until ready to eat. Pop a slice in your toaster and enjoy! There you have it, home-made, healthy fast food. Combine 1 tsp. cinnamon, 1 tsp. nutmeg, and 1 tbsp sugar in a small bowl. Sprinkle on top of your French toast. Store any left over in a container for future enjoyment.